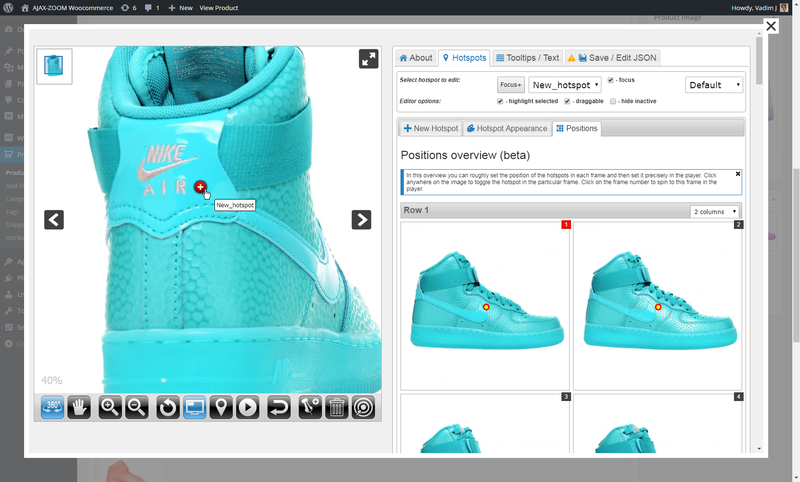 At the product detail page, AJAX-ZOOM plugin replaces the standard image viewer with the AJAX-ZOOM 360 product views, videos and photo viewer. That means that besides regular images, the viewer is capable of displaying 360 spins and videos within one area. 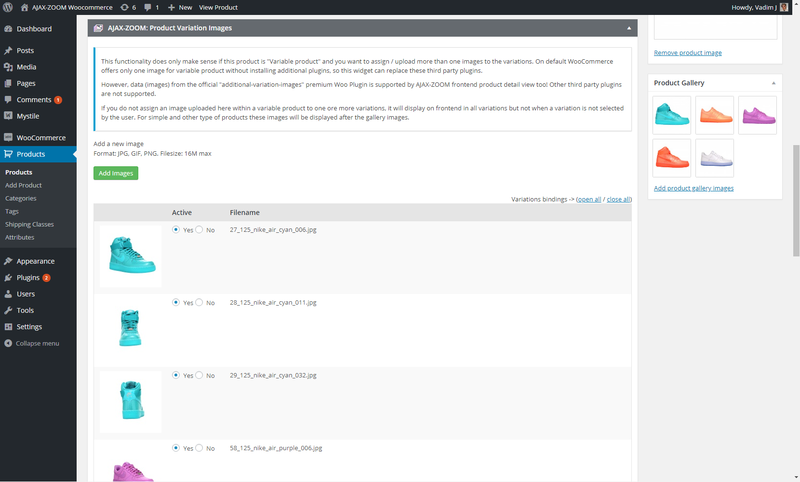 It also connects to the variant articles and changes the set of images and other media types when the user selects a different variant. 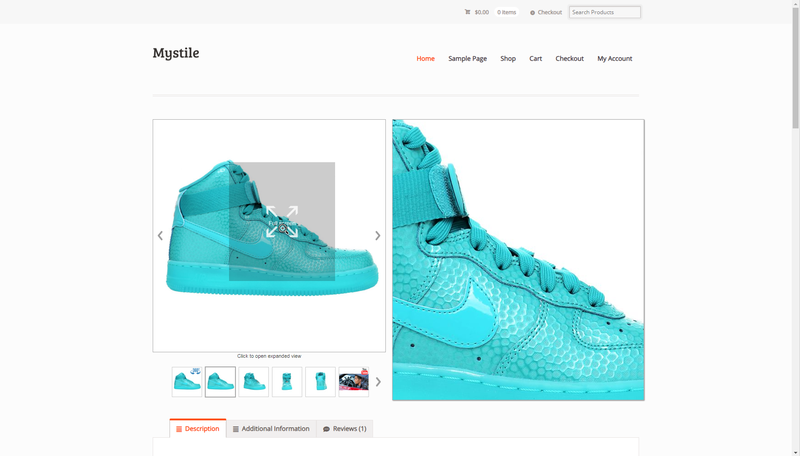 Instead of replacing the default images viewer of the template, you can also place the AJAX-ZOOM viewer with only 360 product views within the product description or elsewhere by using the shortcode. 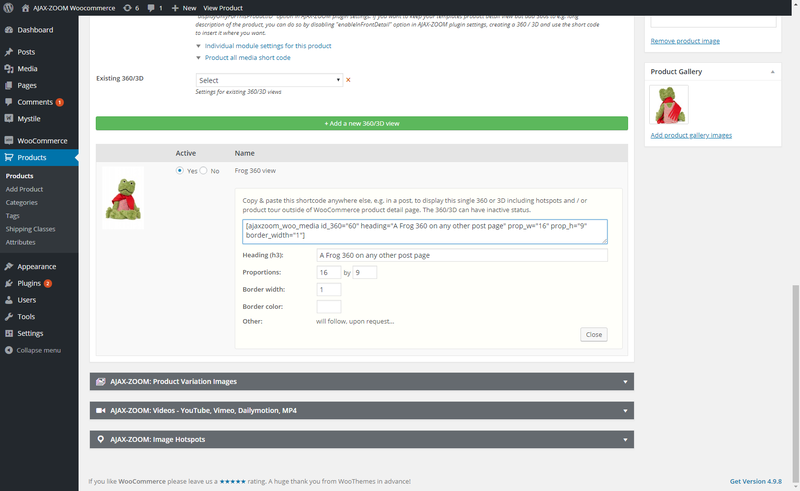 That way it is possible to install a third-party plugin for displaying the images and use the AJAX-ZOOM viewer only for 360 views or deep-zoom images as an option. All those tabs only display after you have created and saved the product because the plugin requires a post-id. 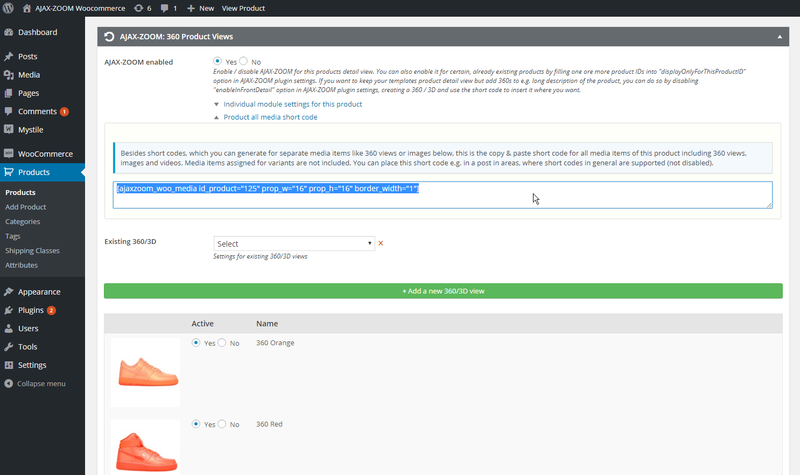 In the "360 Product Views" tab, you can upload 360 or multi-level 3D product images or import them from ZIP files that were previously uploaded to a specified location. Once a 360-spin view is available, it displays in a list. 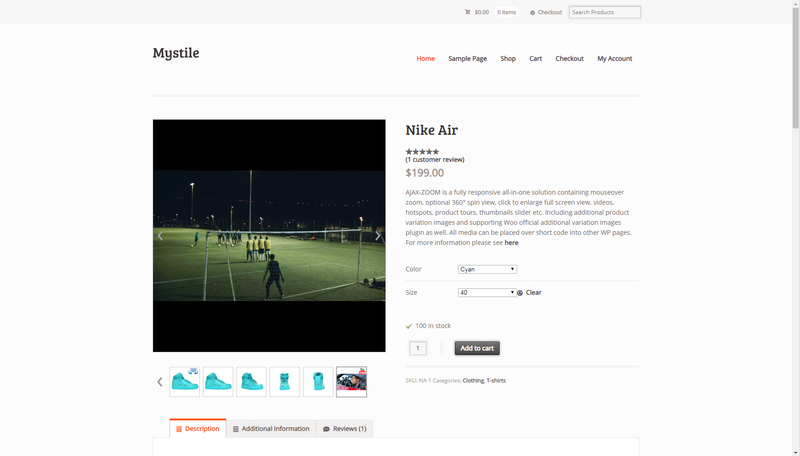 You can create an unlimited number of those views for the same product and match them with selected product variants if available. You can also configure each spin with different settings, e.g., adjust the rotation speed and direction. 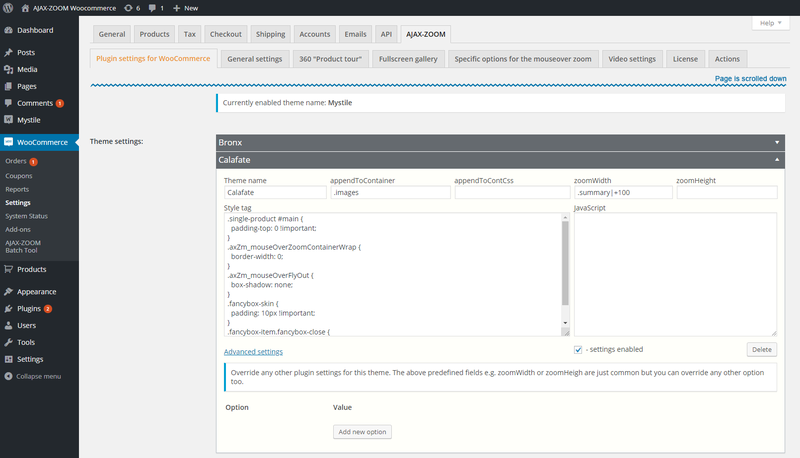 Generally, set all options that are available for the AJAX-ZOOM viewer. Furthermore, you can activate and deactivate a view without deleting it, sort the spin-views, add clickable hotspots via the integrated hotspot-editor and/or create stunning "360 product tours". The latter is exceptionally easy and fast to create. No programming knowledge is required. 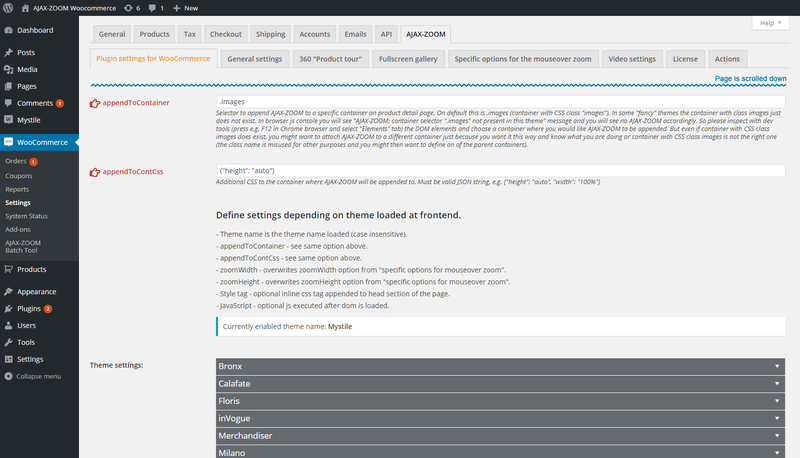 Of course, you can preview everything you have created before actually activating it for the frontend. 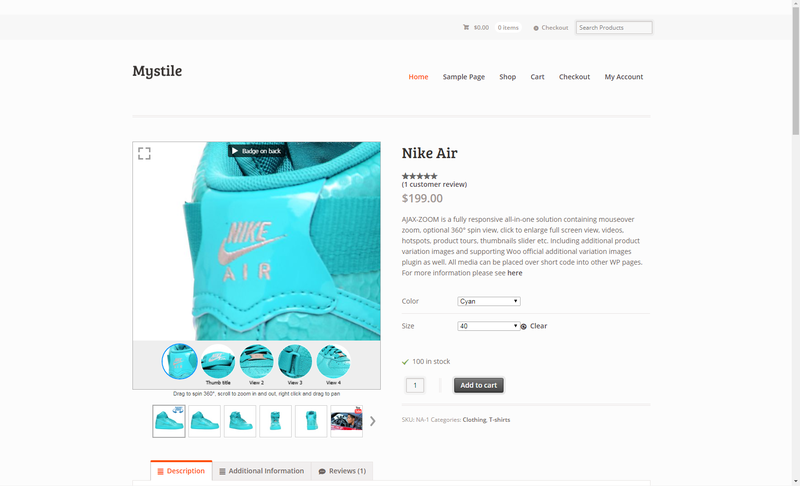 Lastly, there is a field that generates the shortcode for each 360-spin view so that you can insert it between text at a WooCommerce product detail page, a post, or a different page. In the "Videos" tab, you can insert videos from YouTube, Vimeo, and Daily Motion by defining a key-number of those videos, or you can link to an mp4 file by providing the full path to it. Since a video is a configurable instance, there is also a possibility to provide alternative keys or mp4 sources for each of the languages of your shop. 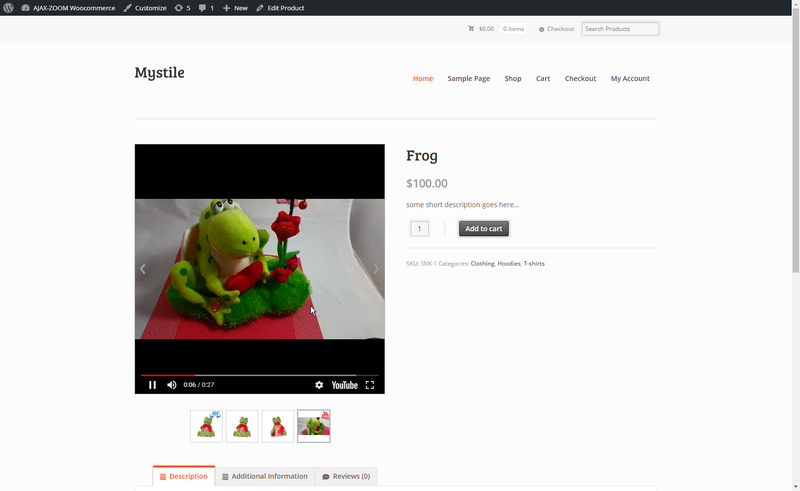 In the backend and the frontend, the plugin instantly retrieves the cover image for that video from the respective video platform. 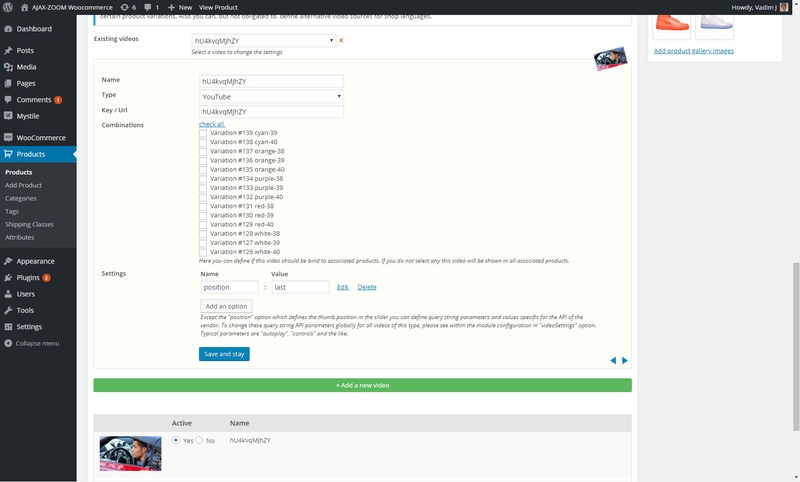 Same as with the 360 product views, you can assign a video to only certain product variations and generate a shortcode to place it at any place that supports shortcode. 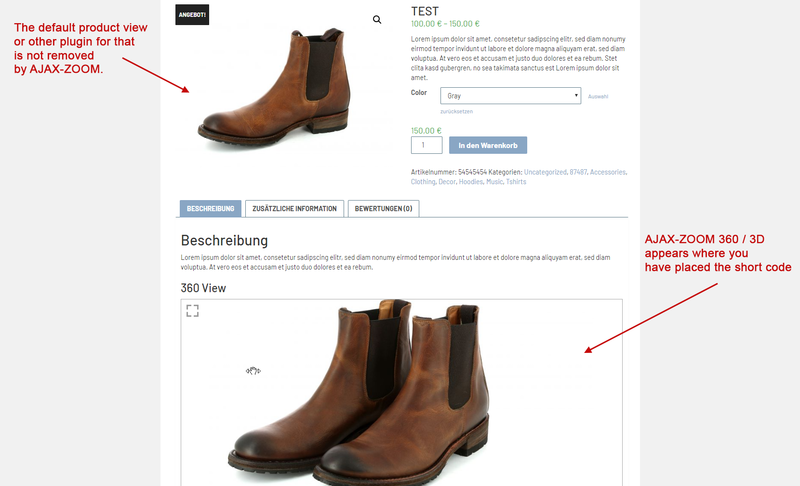 In the "Product variation images" tab, you can upload additional variation images, which is not supported by WooCommerce out of the box but required an additional plugin. 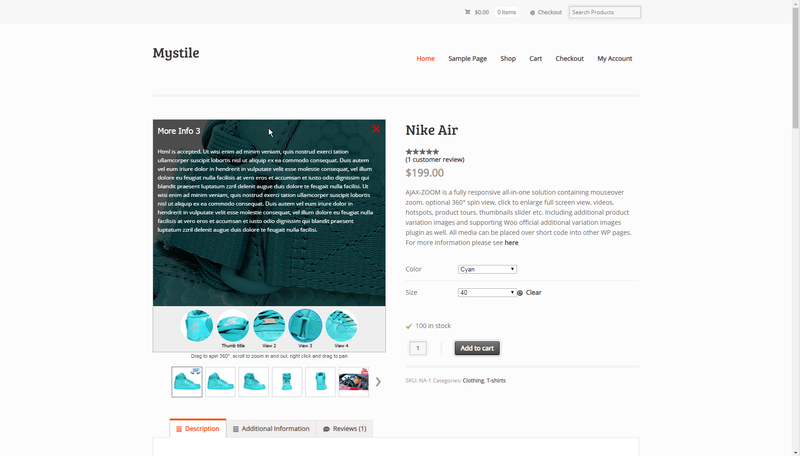 You can use this AJAX-ZOOM plugin functionality or keep using the official commercial plugin developed by WooCommerce. 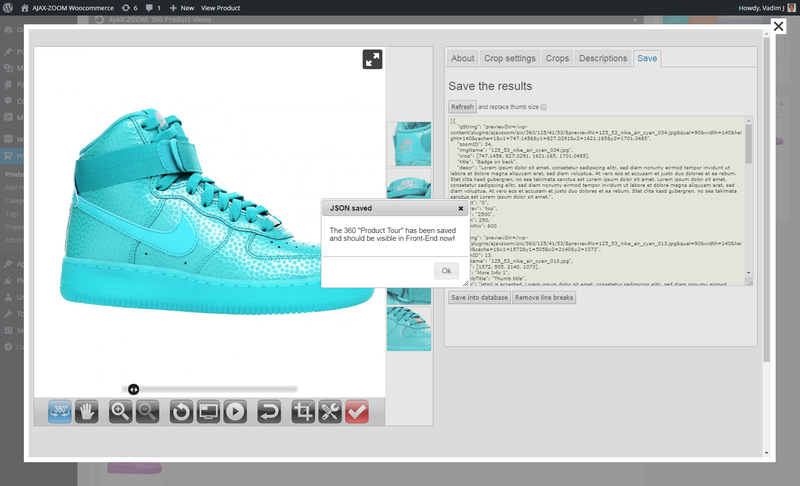 At the front end, the AJAX-ZOOM product view supports variant images from both sources. In the "Image Hotspots" tab, there is a list with all images gathered from all known sources for that article. For each image in this list, there is an optional possibility to add hotspots via the integrated hotspot editor. 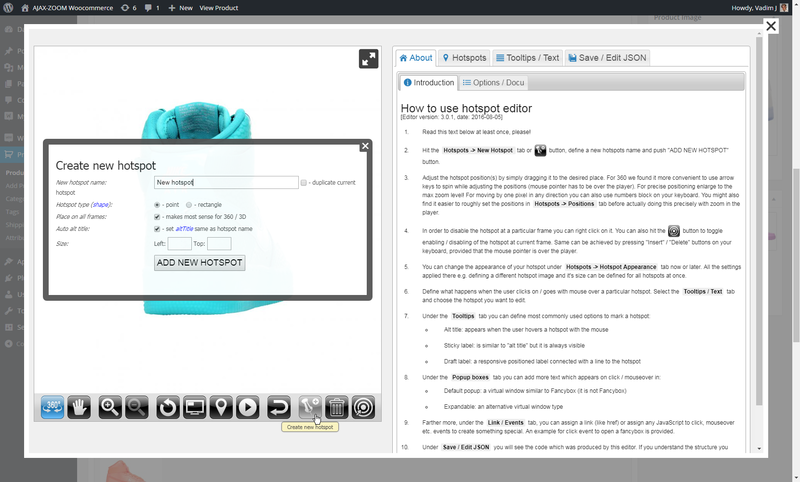 The same editor creates hotspots for the 360 product views. 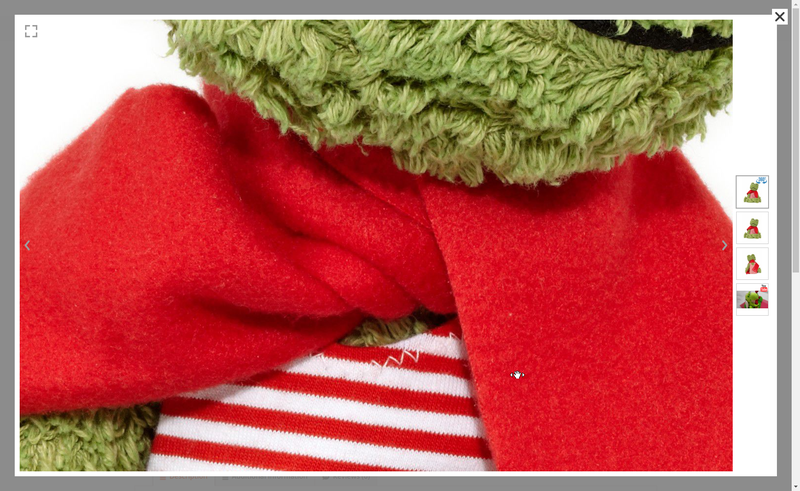 If you have an image with hotspots that you want to put at some other place, you can do it with the shortcode that displays next to each image. 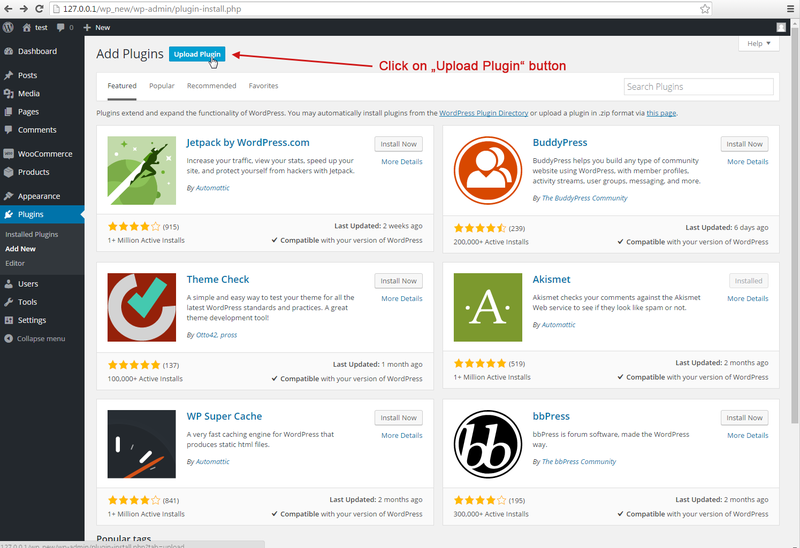 If you want to explore other, more sophisticated features, the best way is to install the plugin and test it. 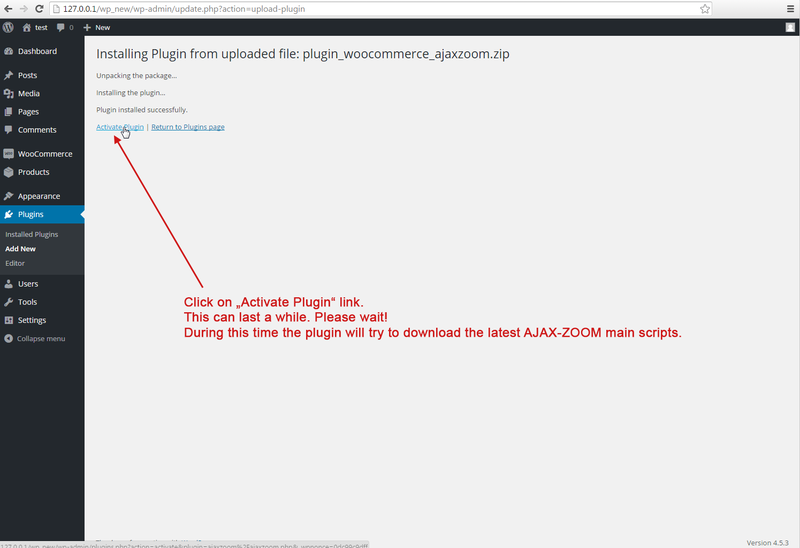 You can freely download the AJAX-ZOOM plugin for WooCommerce / WordPress and test it in your development environment! Mouseover area and flyout zoom window are fully responsive. 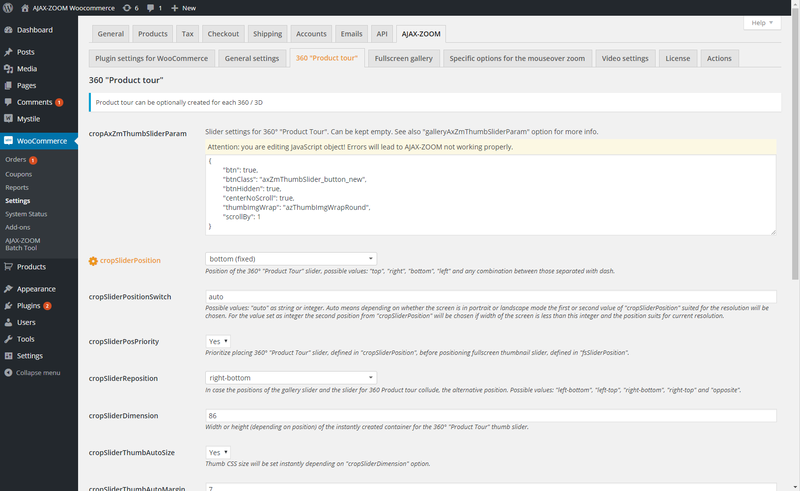 Adjustable to fit the size of any responsive elements by using the smart jQuery-like selector option. Adjustable for fixed or flexible image proportions. 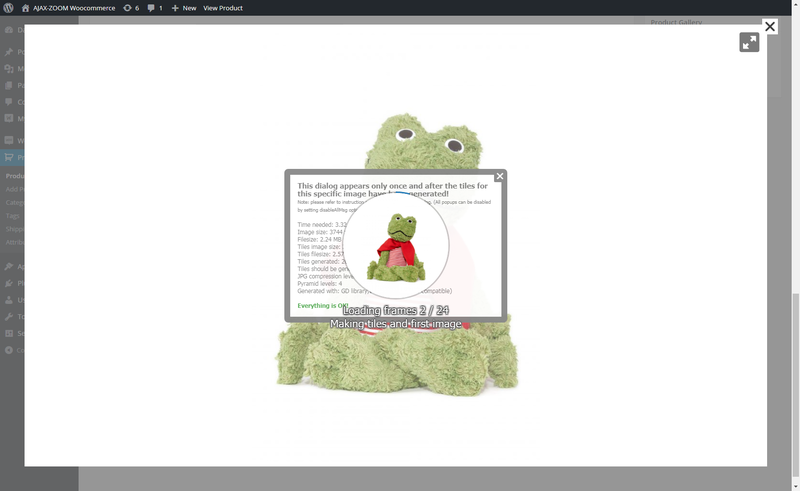 Permanent or automatically enabled "inner-zoom" depending on resolution and responsive layout. 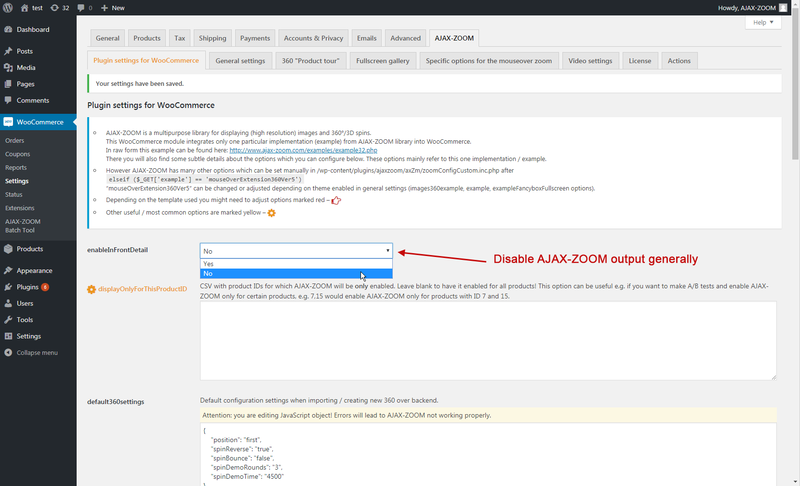 The replacement with the AJAX-ZOOM viewer on product detail page can be disabled and the default viewer of the template used. It is also possible to use a third-party plugin. 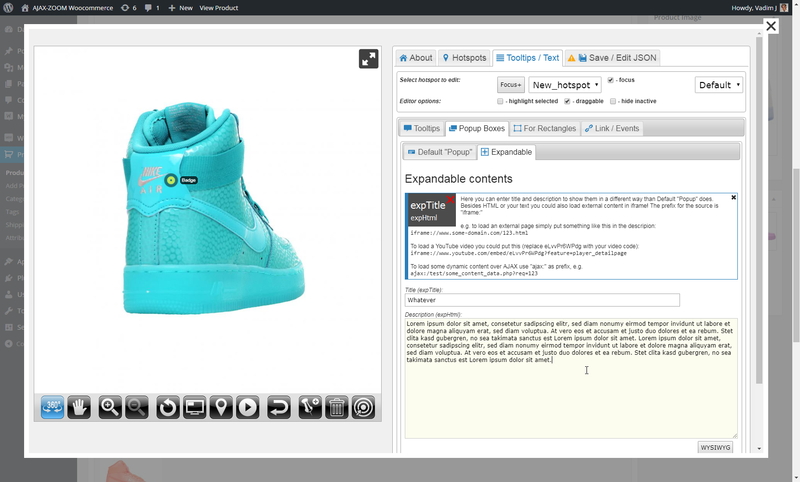 The AJAX-ZOOM media such as 360-product view can be displayed ,e.g. 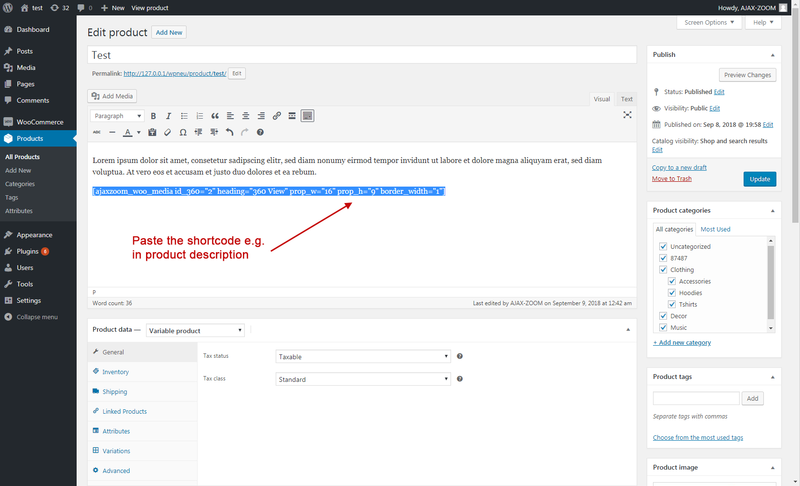 within the product description by using the shortcode. 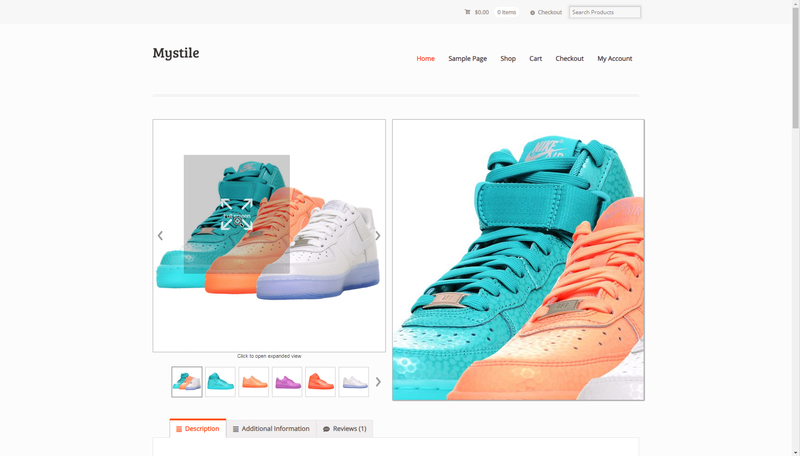 Support for WooCommerce images tied to product variations. 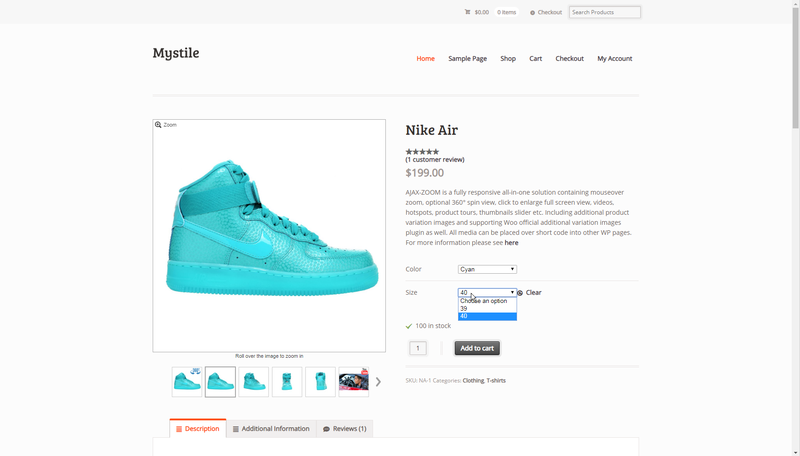 Official WooCommerce Additional Variation Images plugin support on the frontend. Works great on touch-enabled devices including Windows notebooks with touch-screens. Optional 360°/3D degree images support with (pinch) zoom and full-screen view. Optional responsive thumbnails slider integration. 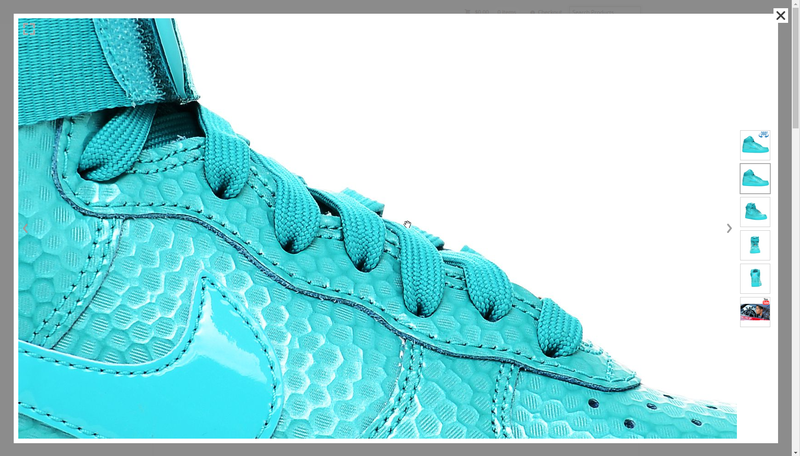 Responsive modal or full-screen views on click with AJAX-ZOOM. 360/3D product tours with or without hotspots. 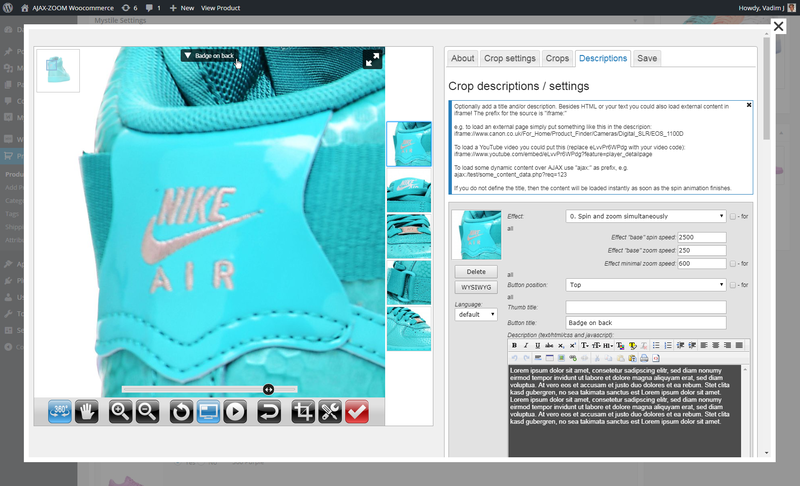 Placing clickable hotspots on the 360/3D degree images and regular images. 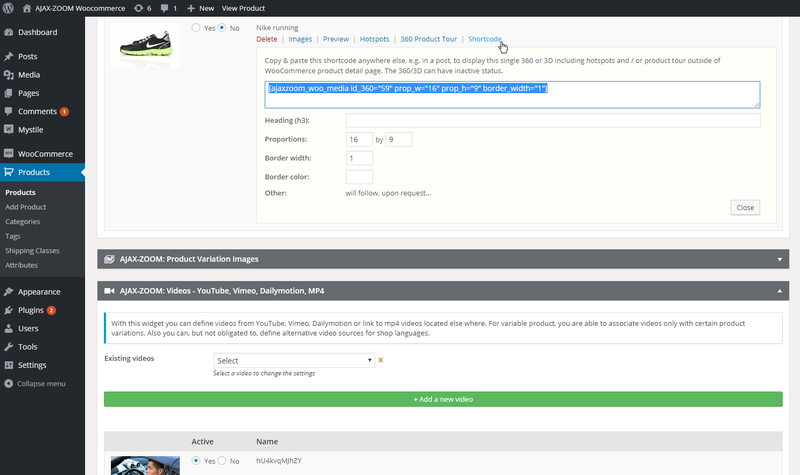 YouTube, Vimeo, Dailymotion, mp4 - videos definitions from the backend, also tied to product variations if needed. 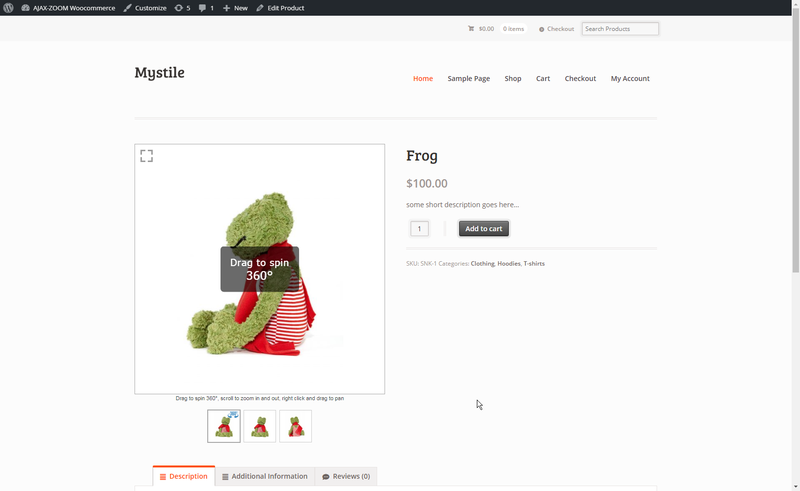 Shortcode generation to display the entire gallery or only some media like images or 360 within description tab or other posts not related to WooCommerce. 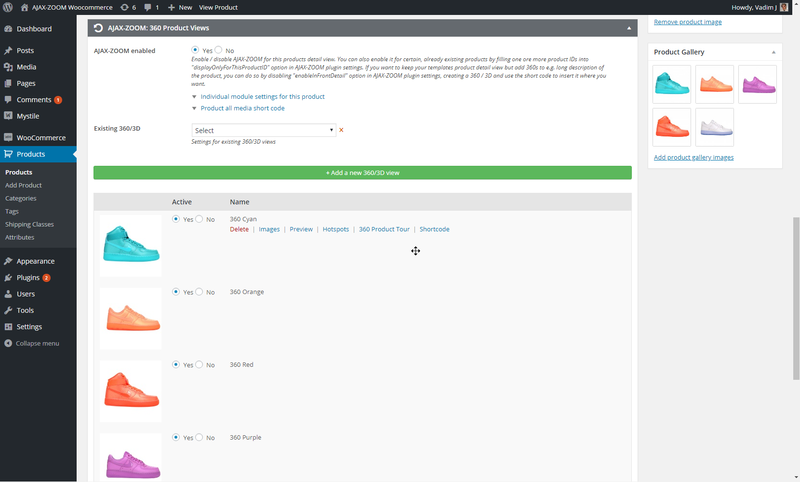 Individual plugin settings for any product (e.g., "axZmMode" option only for a specified product). Fast "progressive" loading of high-resolution images. Instant (on-the-fly) generation of all thumbnails. 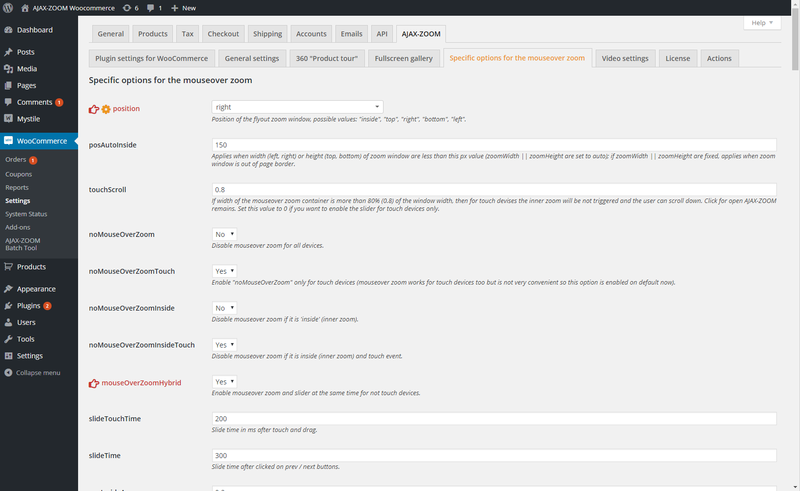 All components are adjustable over WooCommerce plugin settings. API for developers of all skill levels. Continuous development and improvements, technical support. 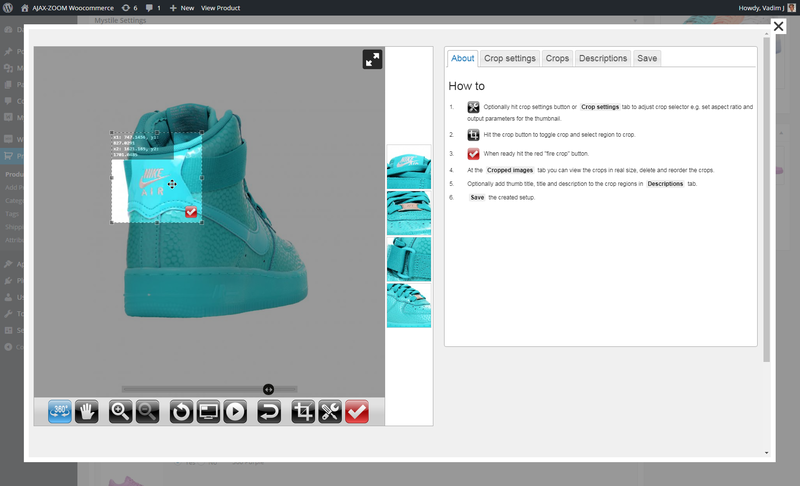 Basic backend handling - uploading a 360 / 3D product view and defining videos. 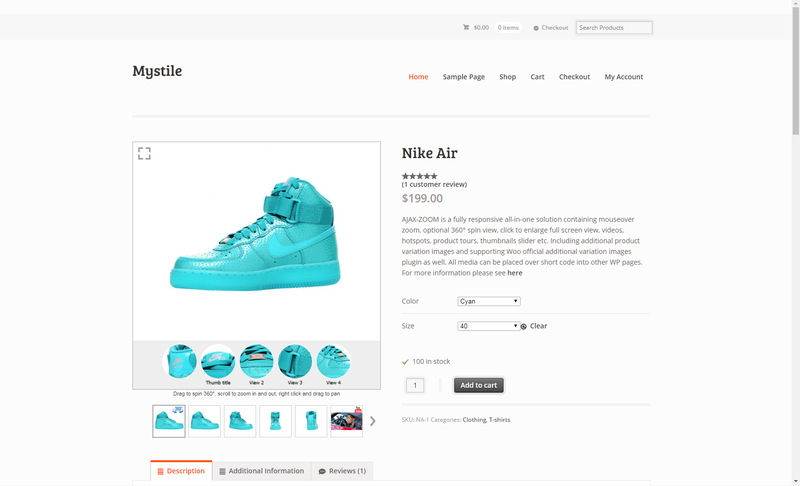 The AJAX ZOOM Plugin for WooCommerce offers full support for variable products. This applies to both 360 / 3D product views, as well as videos and individual (gallery) images. 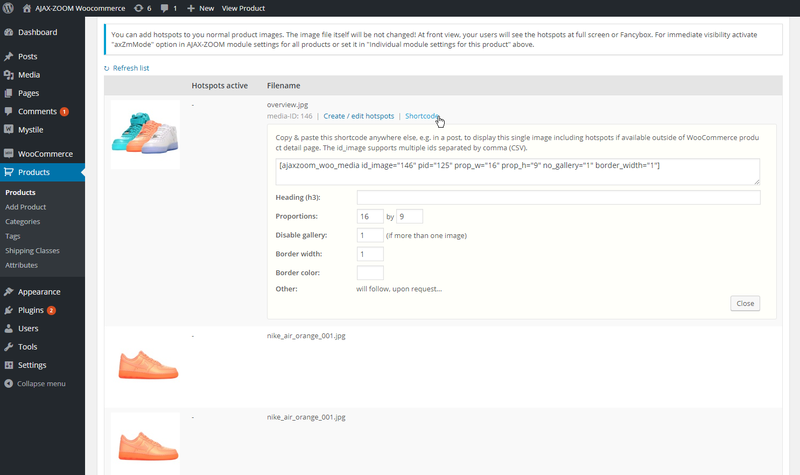 As a nice addition, you can upload more than one gallery images for each variable product without using additional plugins. 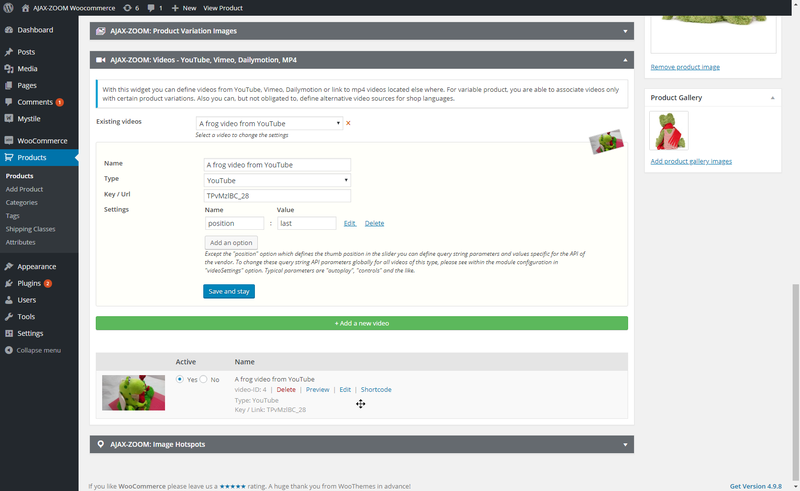 The official premium WooCommerce plugin is supported too. Place WooCommerce 360 images, regular images and / or videos anywhere else besides product detail page / regular WordPress posts by using the shortcodes. 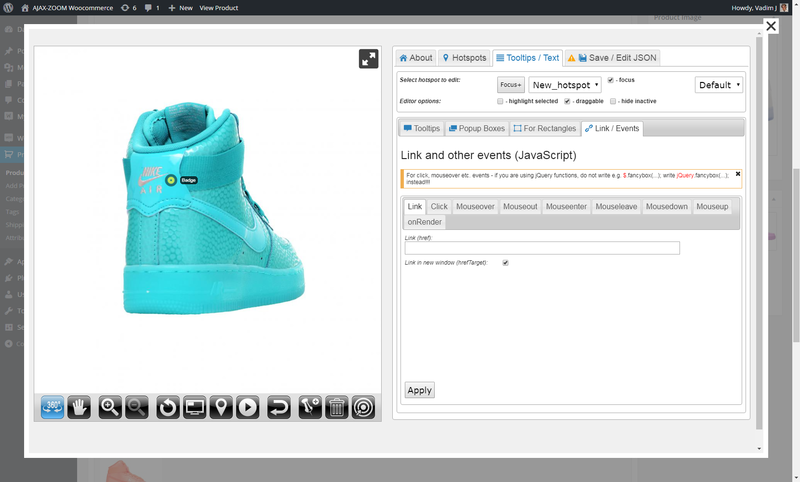 Set AJAX-ZOOM plugin setting "enableInFrontDetail" to no. 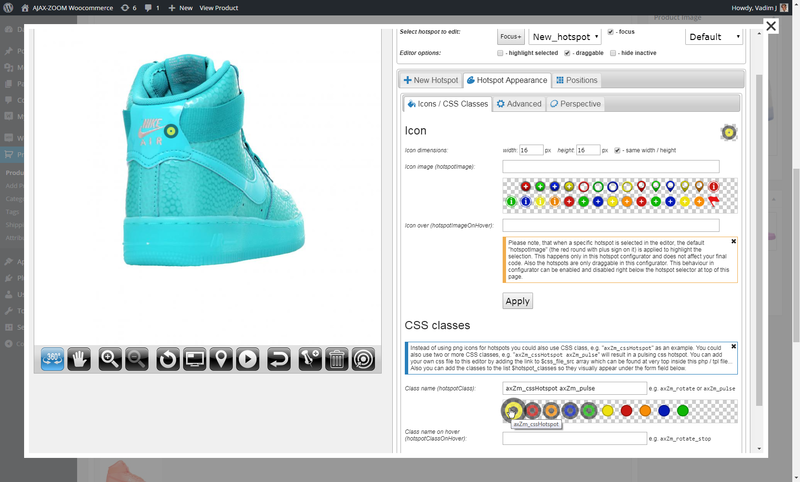 Create a 360 / 3D view and copy the shortcode. Paste the shortcode where you want the item to appear. 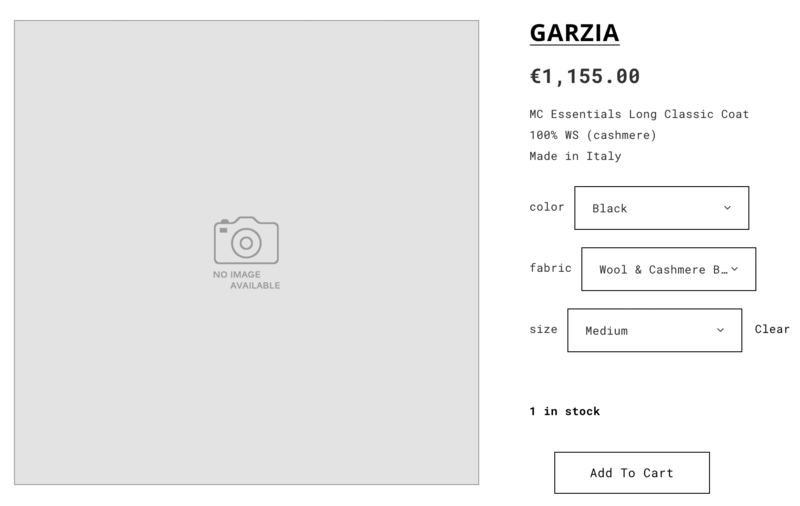 As the result, on product detail page the default view is not replaced and the 360 is placed e.g. in a tab. 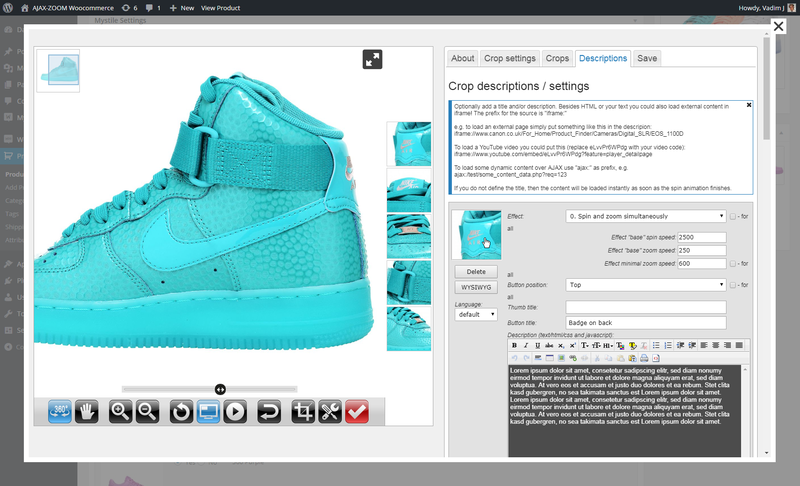 The 360 "Product Tour" Editor is very easy to use. 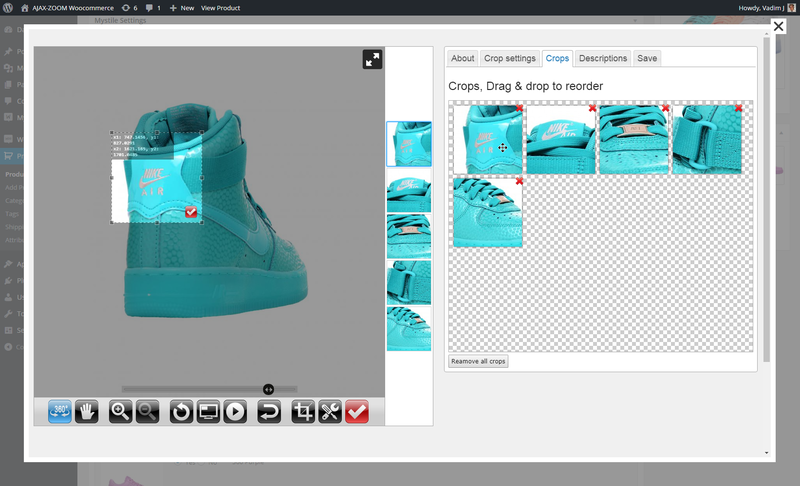 Simply select areas of interest in your 360 / 3D view and press the Crop button. The editor automatically creates thumbnails of these areas and places them in the gallery of thumbnails. When the user clicks a thumbnail in the frontend, the 360 view rotates and zooms to the selected area. There are several predefined animation options available. The 360 "Product Tour" is compatible with hotspots, both support multilanguage texts. Unlike hotspot editor the product tour is done within seconds and revalue your 360 / 3D product spins and thus the presentation of your products enormously without almost any efforts. Creating hotspots on 360 spins or even on multi-row 3D is more difficult, than creating a 360-product tour. The main reason is that you need to position a hotspot at every frame, where a hotspot supposes to show up. Nevertheless, it is doable and with a little practice, you will be able to create hotspots faster and faster. 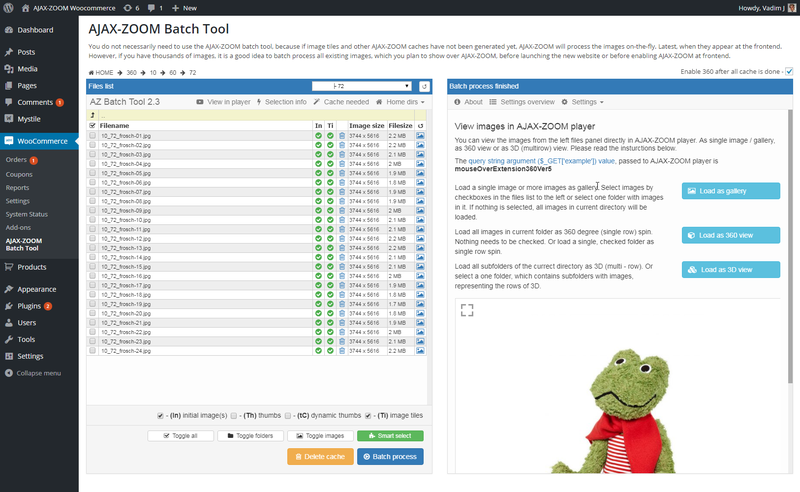 You do not necessarily need to use the AJAX-ZOOM cache batch tool, because if image tiles and other AJAX-ZOOM caches have not been generated yet, AJAX-ZOOM will process the images on-the-fly. Latest, when they appear at the frontend. 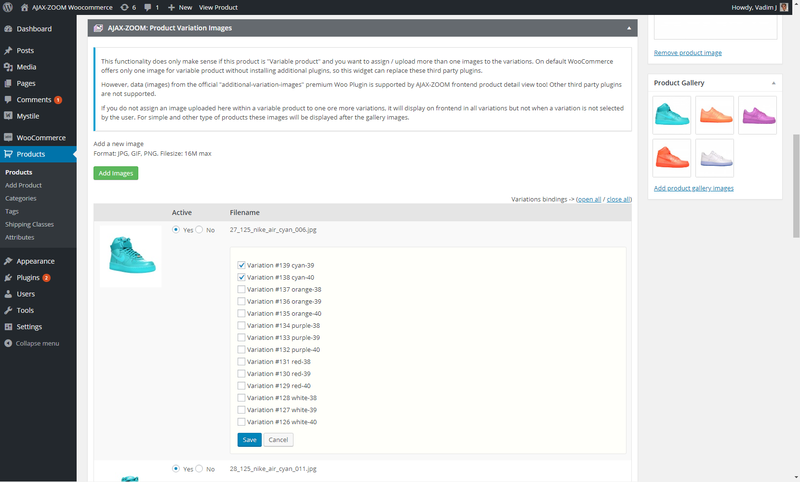 However, if you have thousands of images, it is a good idea to batch process all existing images, which you plan to show over AJAX-ZOOM, before launching the new website or before enabling AJAX-ZOOM at frontend. 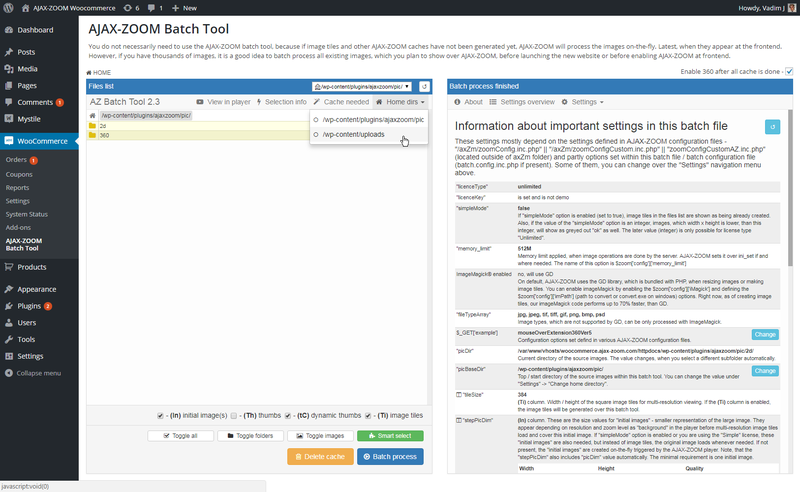 For the 360 views, you can let the batch tool automatically activate these objects as soon as cache files are ready. You can process as many images and 360s, as needed without the need for the administrator to take any actions after the batch is triggered. Multiple folders and subfolders can be automatically recursively traversed. 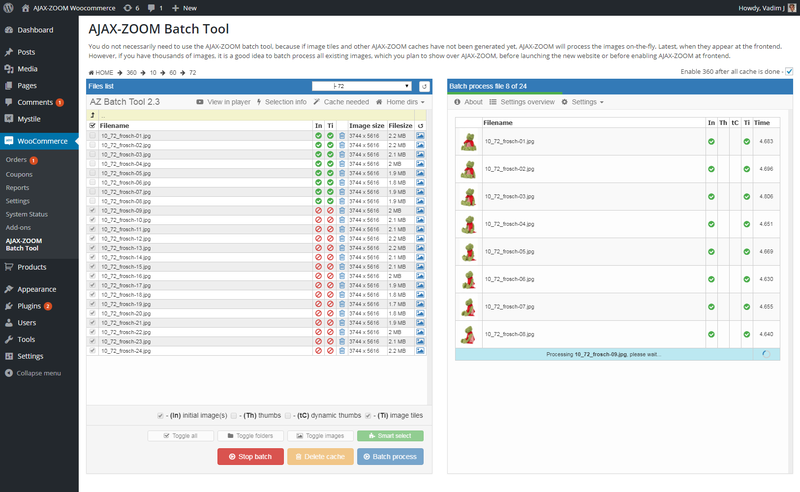 If you do not see the batch tool as depicted in the screenshots below, please update AJAX-ZOOM core files (axZm folder within the ajaxzoom plugin directory). Set any option you can think of. By the way, it is also possible to set these options for each product individually. At least, this is very handy, if you prepare a set of media to be included over shortcode somewhere else on your website. However, even though this setting is changeable, it could be not sufficient to achieve the expected result. Changing the theme is an option but not a programmatic one because those changes will be overwritten during the next update of the theme. 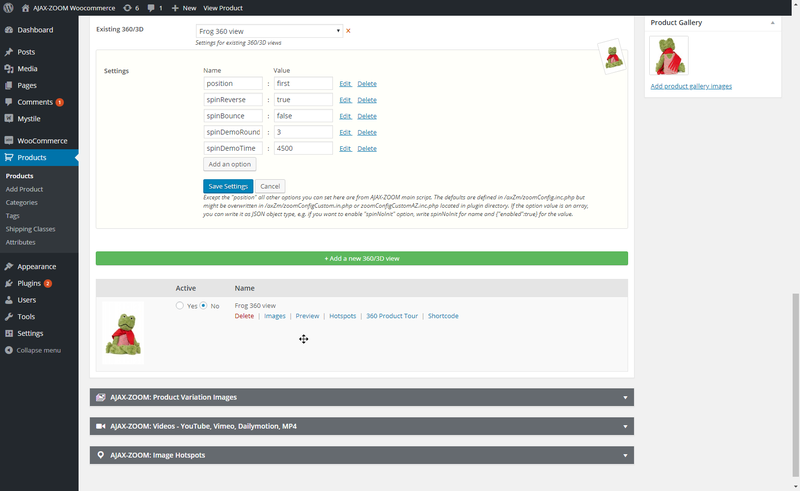 The workaround solution we offer is the "theme adjustment widget" as depicted below. 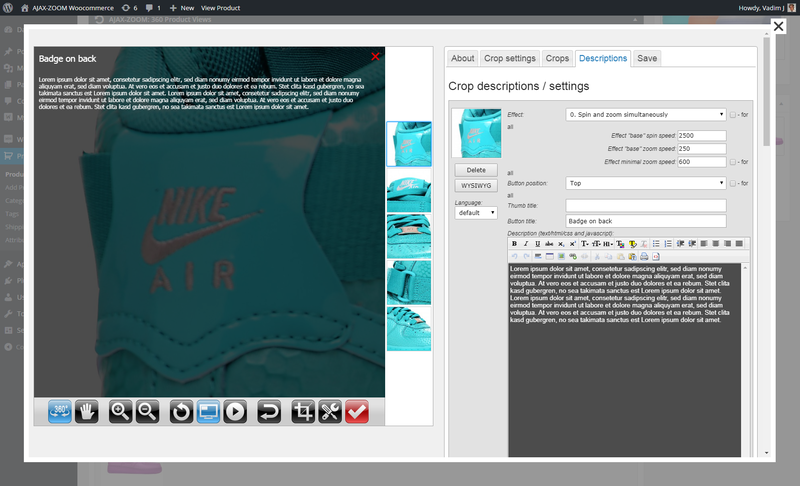 This widget has many tools to adjust the layout as needed without changing the code in your theme. 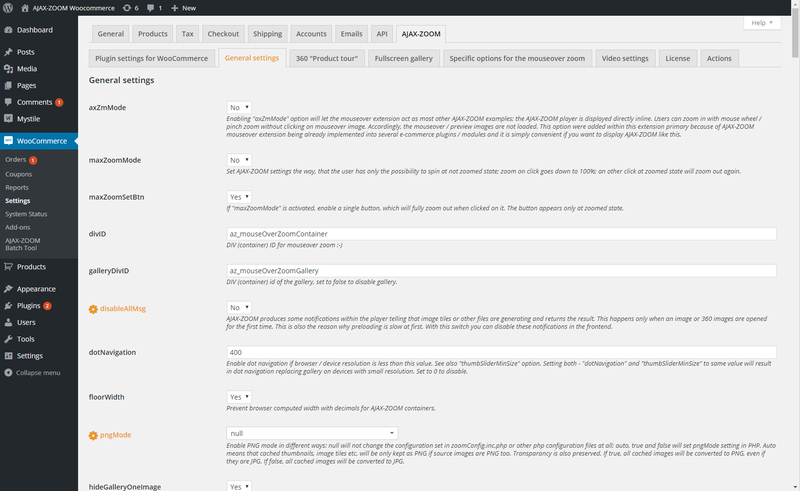 All adjustments you make are specific to a theme name, so you can create adjustments for many themes as you like and enable / disable the adjustments without removing them. The widget has already few adjustments for themes we had to deal with. 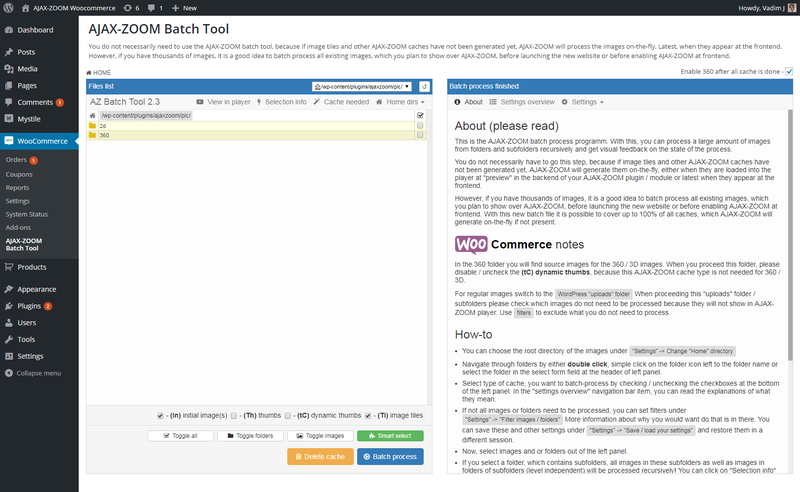 We can claim, that the toolset offered in this widget is enough to deal with any possible issues. Admittedly, dealing with harder tasks, it is not self-evident what to write in there exactly. 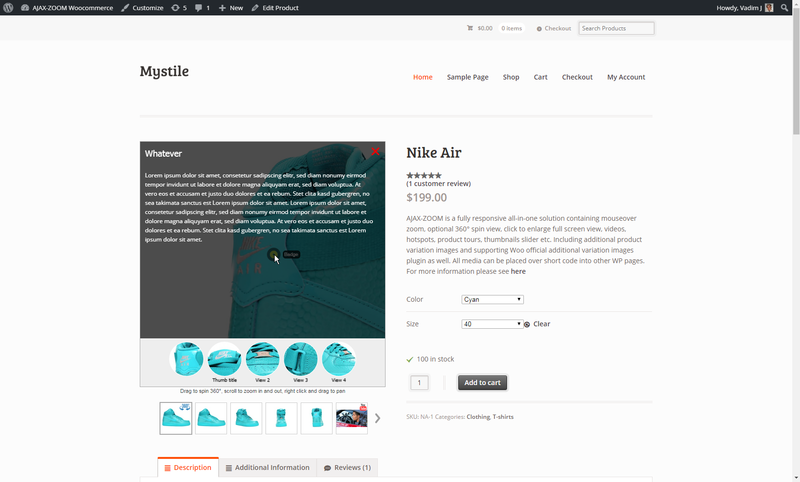 In case, there is a need and you have hard times finding the right adjustments for your product detail page, please contact our support with the link. 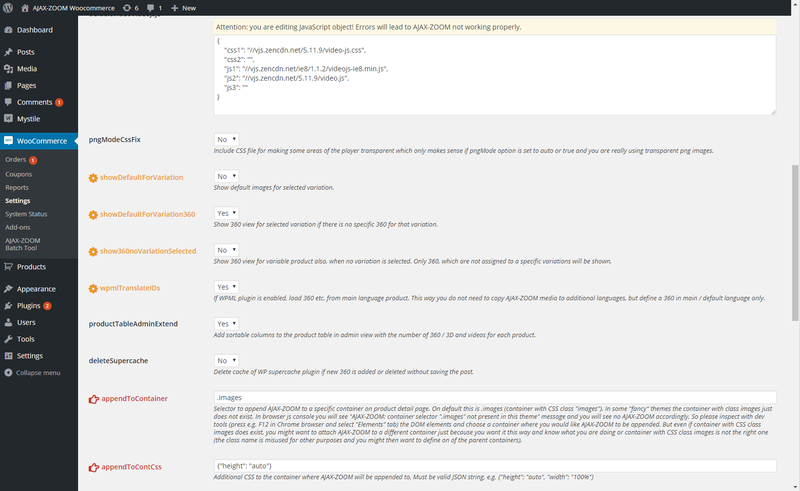 Frontend detail page screenshots with default settings - Mouseover Zoom is activated. There are several settings to change this into slider or zoomable area upfront. For the regular images there is no need to do anything. You can upload them as always. 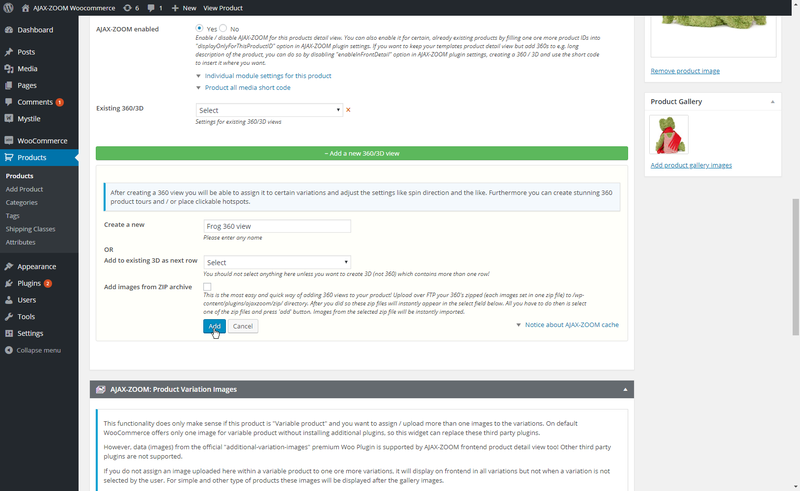 However for product vatiations there is a possiblity to add any number of images without additional plugins. On default there is not such an option in Woo. Select a zip file which contains images for a 360° set to import. On default these zip files have to be uploaded in '/js/axzoom/zip/' directory and can be removed after import. 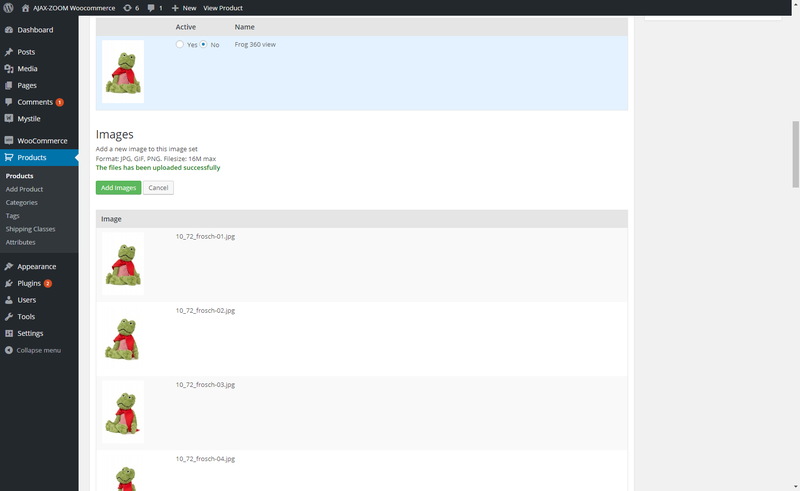 You can upload the plugin as depicted in the screenshots below or you can extract the ajaxzoom folder from the zip file and upload this folder into /wp-content/plugins directory. If you chose the second way, please make sure, that the /wp-content/plugins/ajaxzoom directory is writable during the activation and the /wp-content/plugins/pic folder is always writable by PHP. Make sure the free Ioncube loaders are installed on the server. Switch to Plugins and click on "Add New". Before activating the plugin please make sure, that the /wp-content/plugins/ajaxzoom/pic directory is writable by PHP - set corresponding chmod. 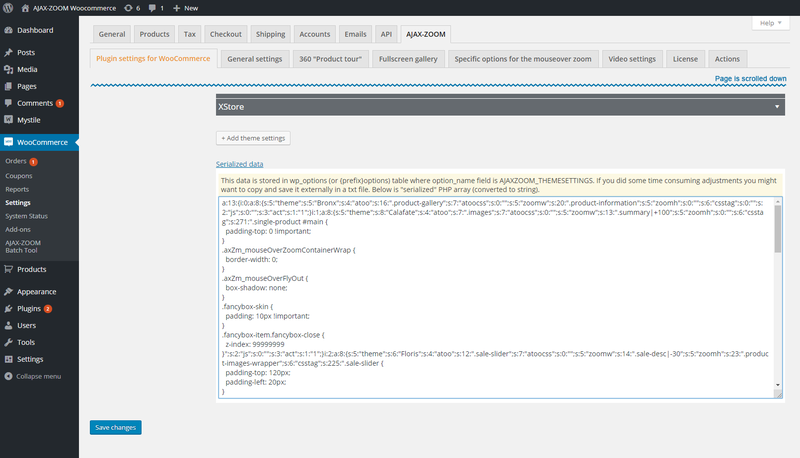 The activation will fail with AJAX-ZOOM error message, if this folder is not writable by PHP! 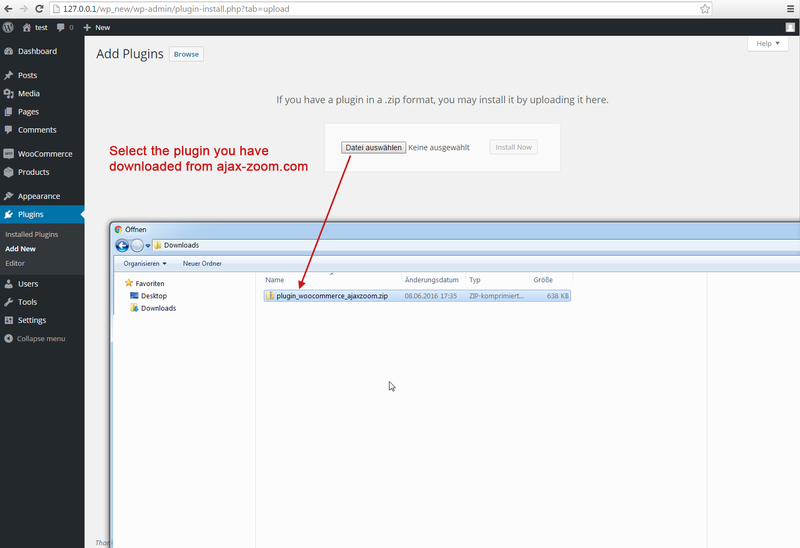 Important: if you upload the plugin - /wp-content/plugins/ajaxzoom - manually over FTP, make sure that /wp-content/plugins/ajaxzoom/pic directory is writeable by PHP - set corresponding chmod. The plugin will need to create several subfolders in this directory, so it must be writable before activation (install process). If neither of the two do_action functions are present / missing in frontend template, then there will be no output and AJAX-ZOOM cannot be visible at all. 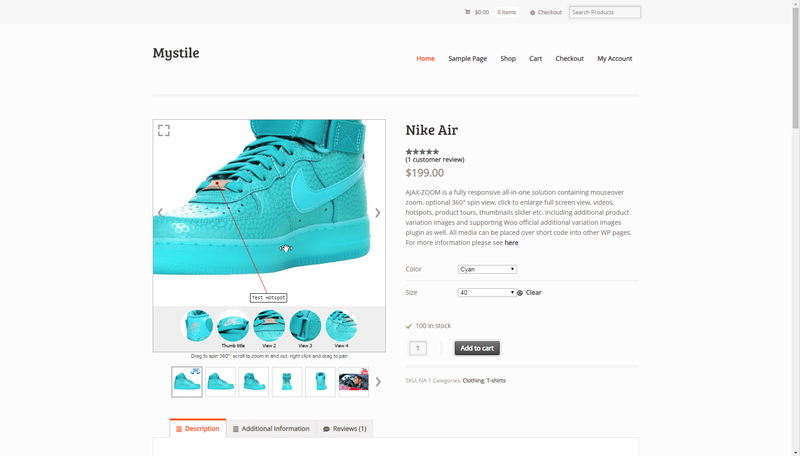 If AJAX-ZOOM code is returned on the product details page but you do not see anything or AJAX-ZOOM does not work properly, then you might need to make some adjustments for you theme. 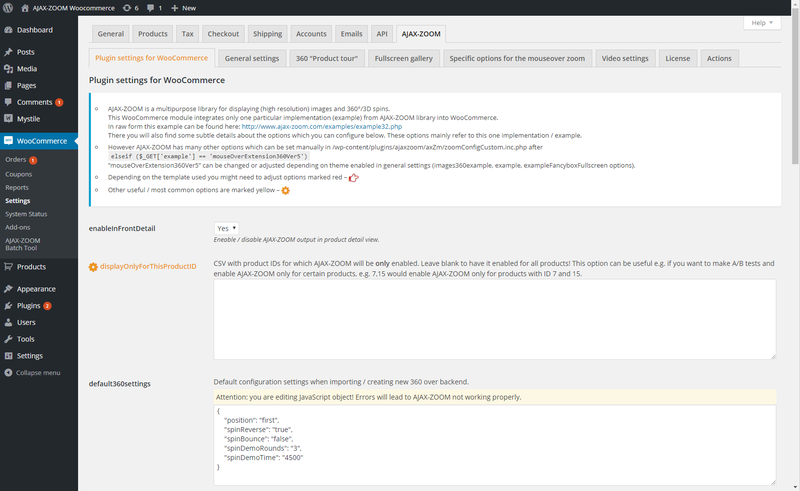 Go to Wocommerce Settings -> AJAX-ZOOM -> General Settings. At very bottom there is a widget with which the adjustment should be possible for any template. Please check in browser console under network -> XHR if the request to zoomLoad.php returns error 500 (server error). 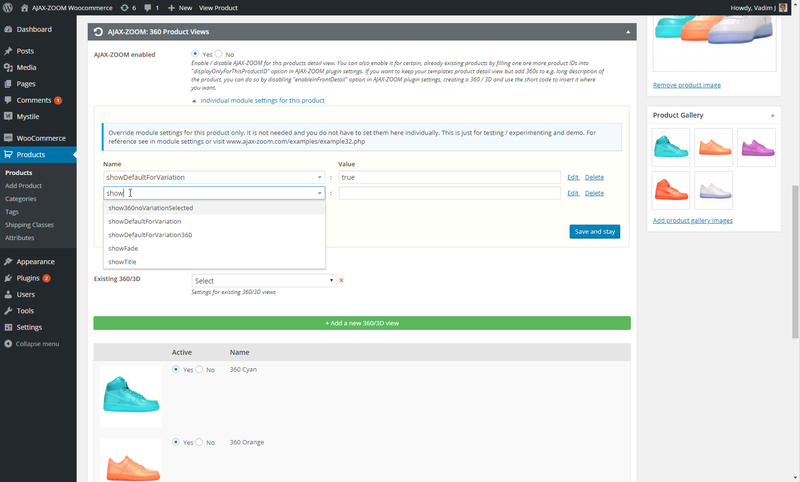 This might happen because of wp-content/plugins/ajaxzoom/lic.php which includes the WP config file in order to quickly read the license data entered in the AJAX-ZOOM plugin configuration page at the backend. 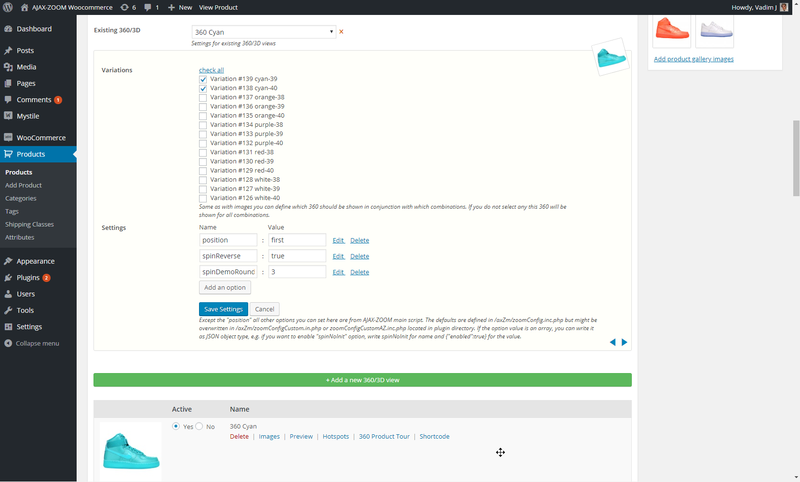 The error is likely to be present if WordPress has been installed using Bitnami. Try to comment out / remove everything in lic.php; if AJAX-ZOOM works now please just keep it like this. 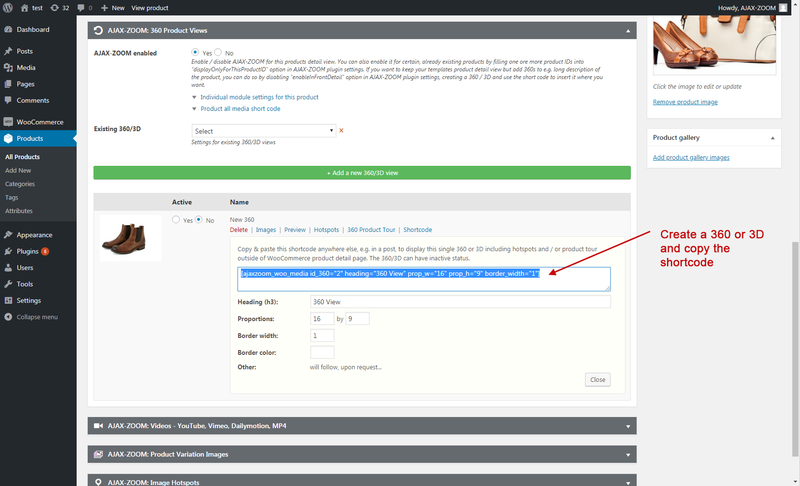 You can also enter / hardcode licensing information into wp-content/plugins/ajaxzoom/zoomConfigCustomAZ.inc.php without retrieving the values from DB which is even more faster. 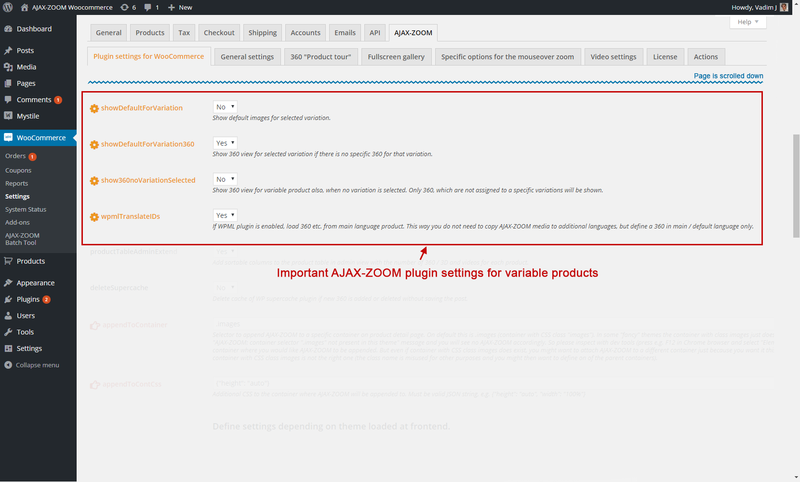 If you have variable products but did not define any images for you variable products, please enable AJAX-ZOOM Plugin showDefaultForVariation option, which is disabled on default. You can do this in plugin configuration settings. There could be another reason, why the AJAX-ZOOM player is loaded but the images do not show in it. You do see a perpetual loading animation. Enter https://www.your-domain.com/wp-content/plugins/ajaxzoom/axZm/zoomLoad.php in the browser address bar. 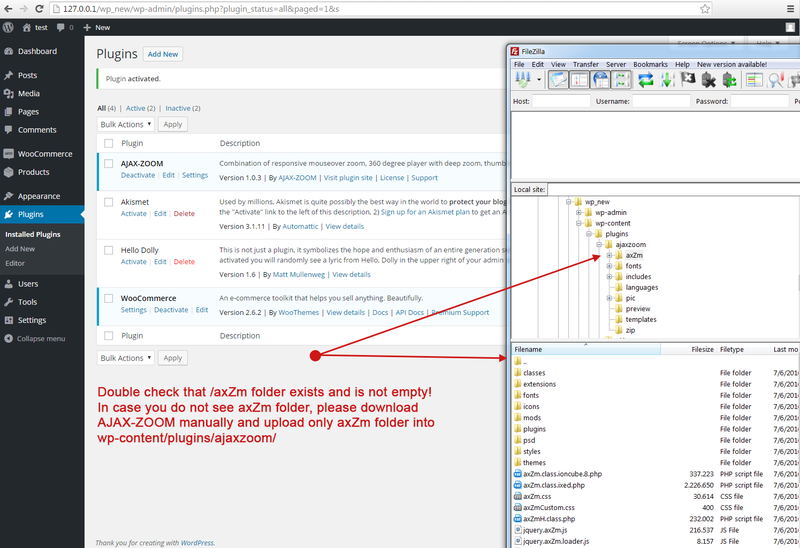 If the file zoomLoad.php is physically present but you get an error 404 (not present) or error 500 (server error), the most likely reason is that the folders and / or files permissions (chmod) are set to values, where group can edit them and on shared hosts the server configuration often treats this as not acceptable. Most likely, you will need to set the folders permission level (chmod) to 0755 and the files permission level (chmod) to 0644. Skip the leading zero if you are using an FTP program such as FileZilla. Fixed files and folders permission issues. 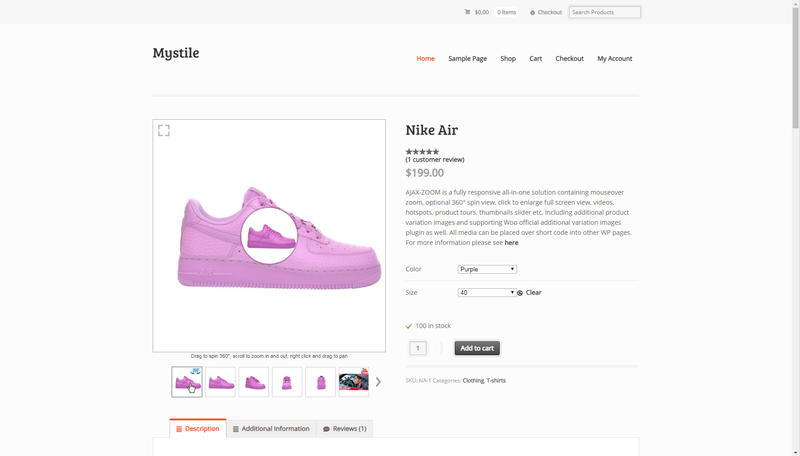 Fixed error thrown by WooCommerce when removing a product variation. 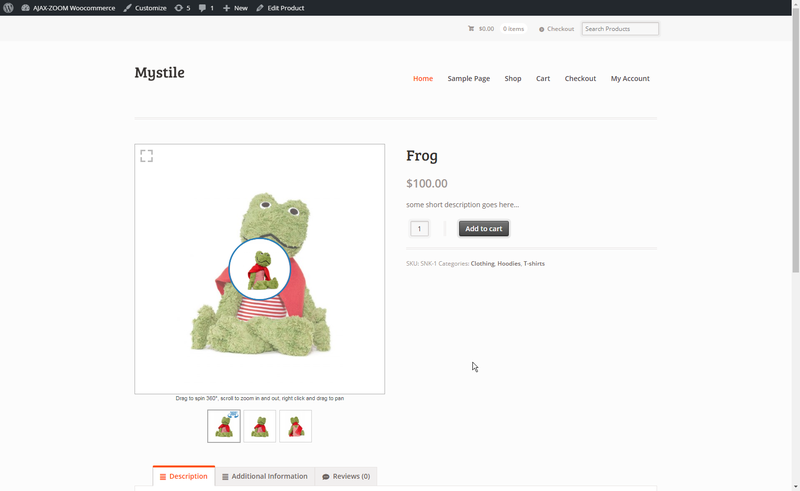 Fixed first WooCommerce variant image not showing in the gallery in the newer WooCommerce versions. 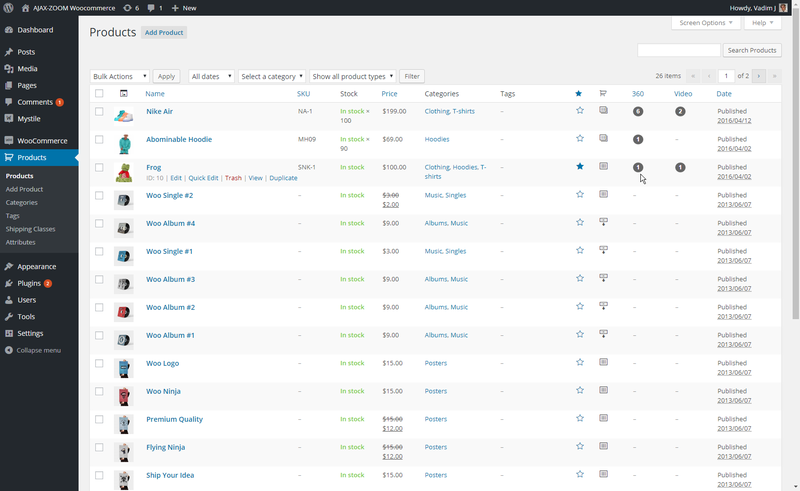 Added sortable columns to product list with number 360 / videos attached to each product. Moved batch tool under a different menu location and added the possibility to automatically enable 360 / 3D after the cache for an item is created by the batch tool. Registered uninstall hook (deletes AJAX-ZOOM DB tables and options, when deleting the plugin). 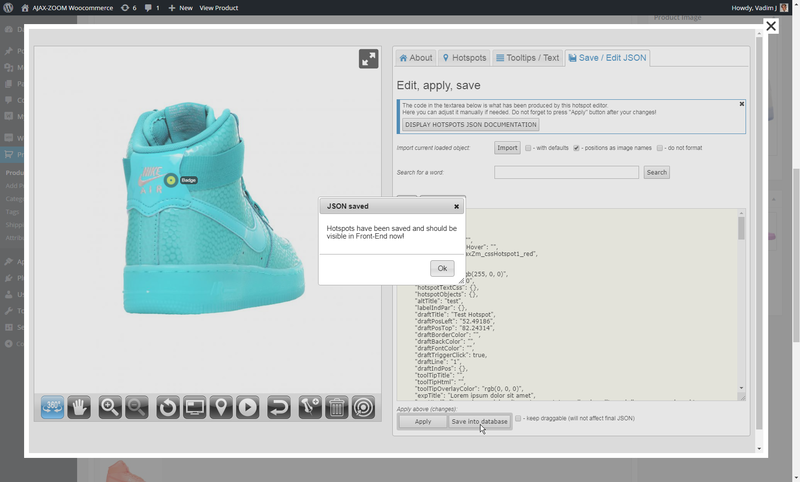 Intergrated the AJAX-ZOOM batch tool directly into the backend. AJAX-ZOOM core update (v. 5.3.5+) required. 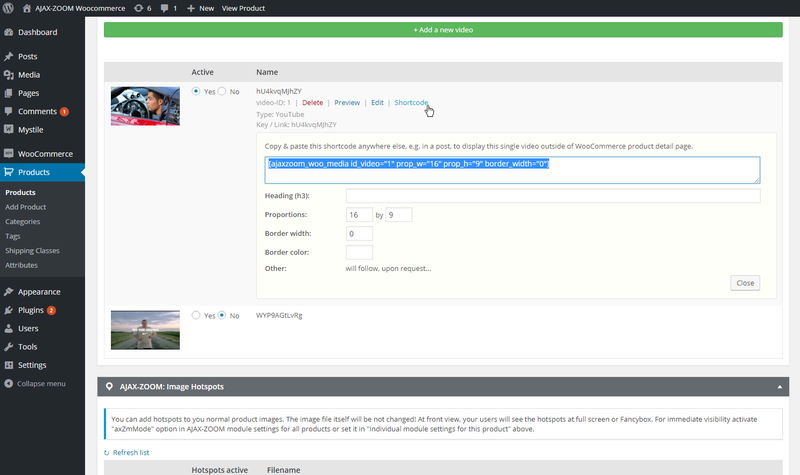 Added configurable permission level variables for folders and files, where uploaded and cached images are stored at. Fixed a possible PHP notice. Added some WPML support. The change will allow not to upload same 360 for additional languages / posts, but show same 360 from default language. Fixed possible PHP error when saving coupons in WooCommerce. Fixed lic.php file, which could have caused server error on some server configurations. Fixed a JS error on frontend for variable products for if there are no variation images at all. Added an option, which allows to show 360 for variable products when no variation is selected. 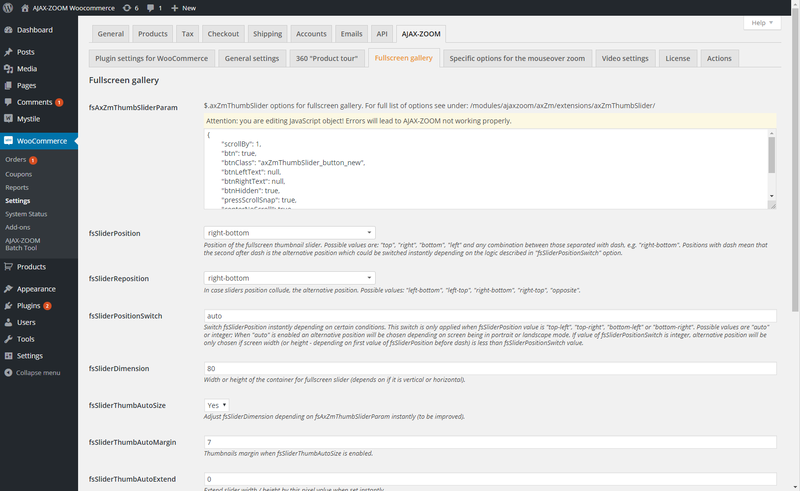 Added plugin update notification and possibility to update the plugin from our repository. Added possibility to backup currently installed plugin version. Fixed a newly coded bug where the hotspot editor for 360 was not useable because of passing wrong path to it. Added several checks while installation and if something goes wrong the errors with the hints about how to resolve them will be displayed after activation attempt. Also the plugin will deactivate itself in this case. Improved sort order of the images, 360 and videos. Fixed database version matching. So after overwriting plugin files there is no need to run installer any more. Removed some possible warnings when debug mode is enabled. 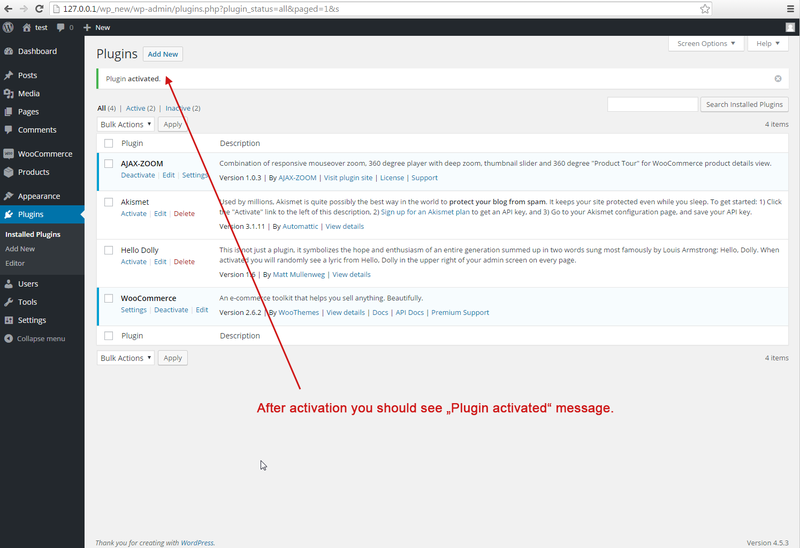 For update from previous versions - overwrite plugin files, update axZm directory, deactivate and activate plugin. 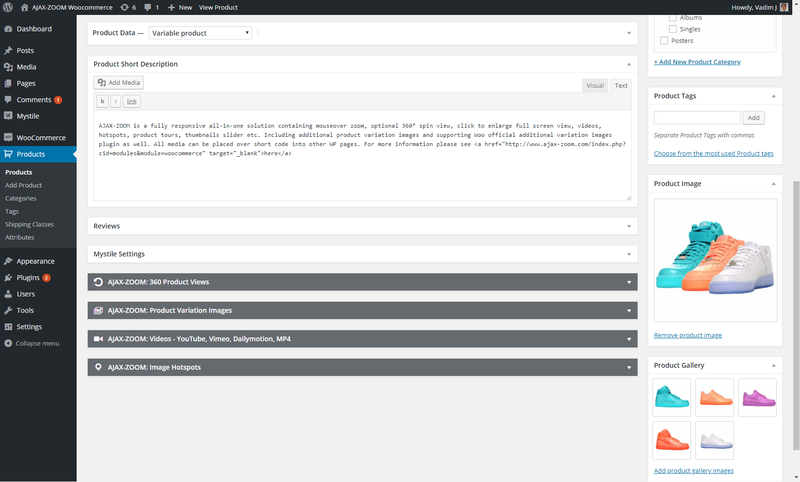 Update /wp-content/plugins/ajaxzoom/axZm folder with core AJAX-ZOOM files. Diverse bugfixes and new options. Tested with latest WP and Woo. 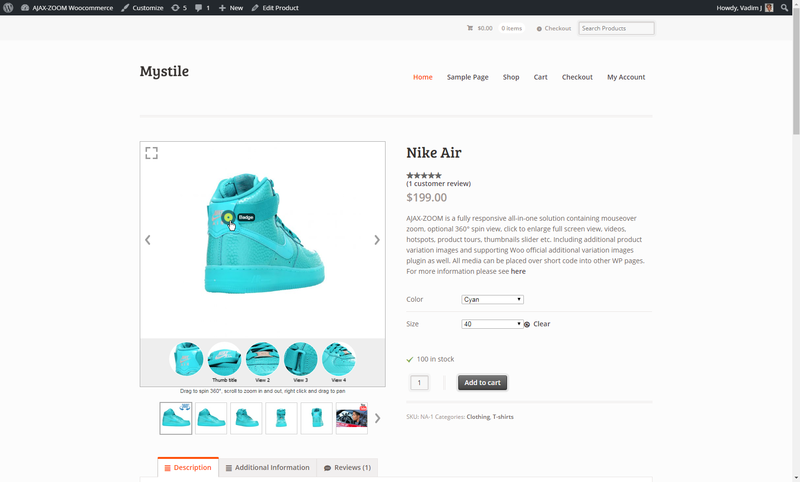 Support for WooCommerce 3.0; implemented new mouseover zoom (version 5); Created a widget in plugin settings to adjust / change AJAX-ZOOM injection into detail page (target container, additional css, js, options etc). 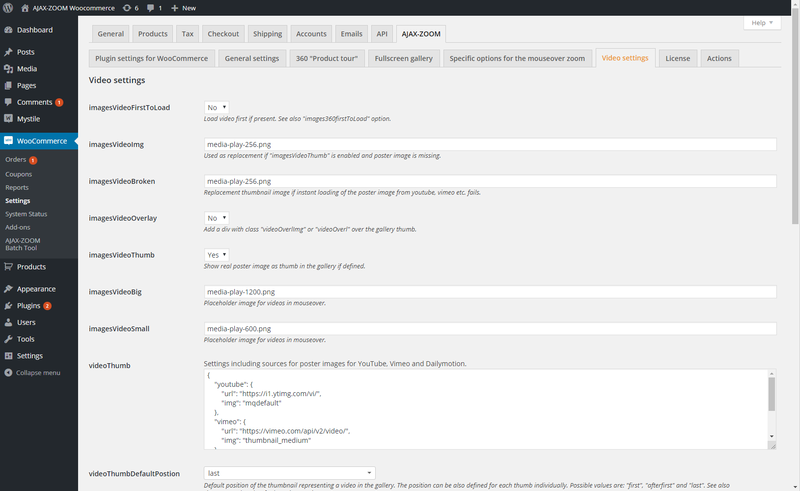 With this widget it is 99.9% guarantied that AJAX-ZOOM can be adjusted to work with any theme. For update from previous versions - overwrite plugin files, update axZm directory, deactivate and activate plugin. 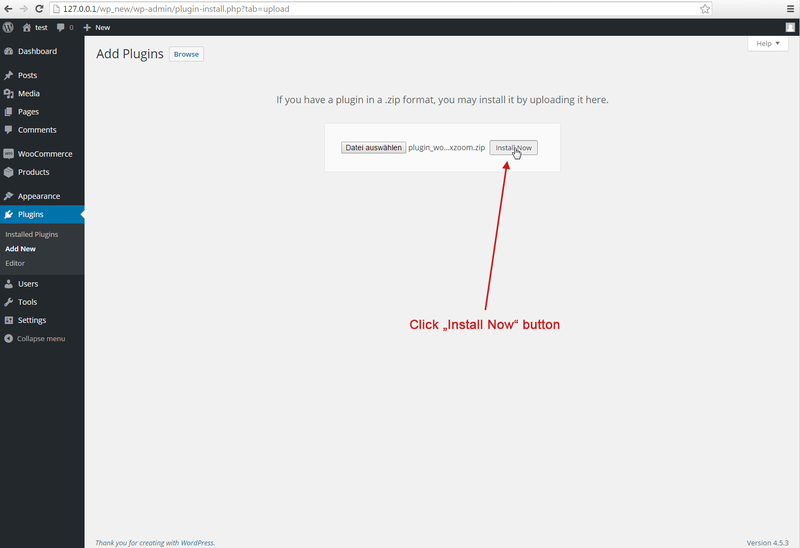 Navigate to plugin settings, select "reset" tab and reset settings. Added missing DB table for individual deactivation. Fixed bugs creating db table for variants images. 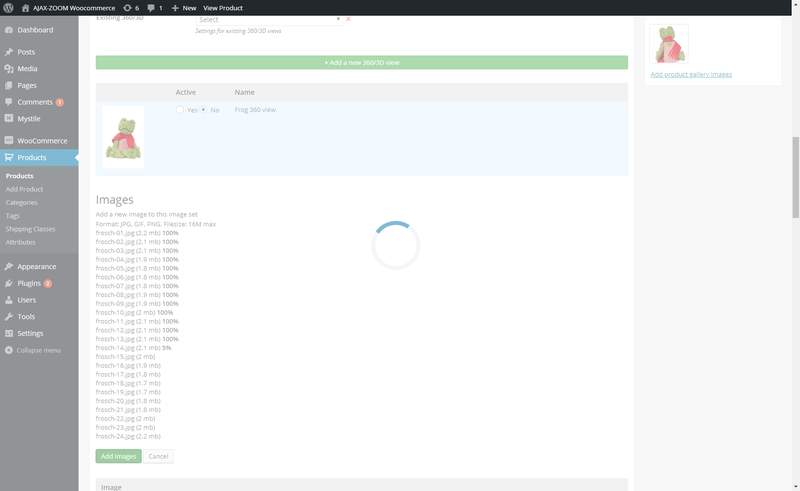 Fixed 360 uploding problems on "localhost". Several improvements and speed optimizations. 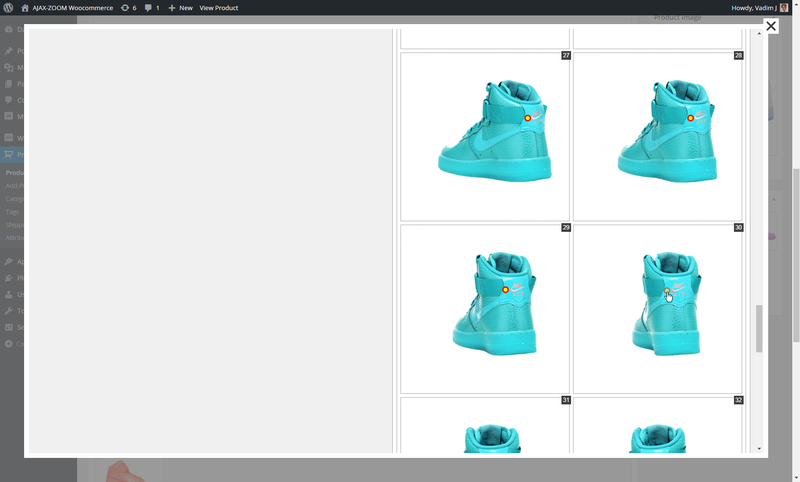 Added a tab where you can upload unlimited images for product variations. WooCommerce supports only one on default without additional plugins.